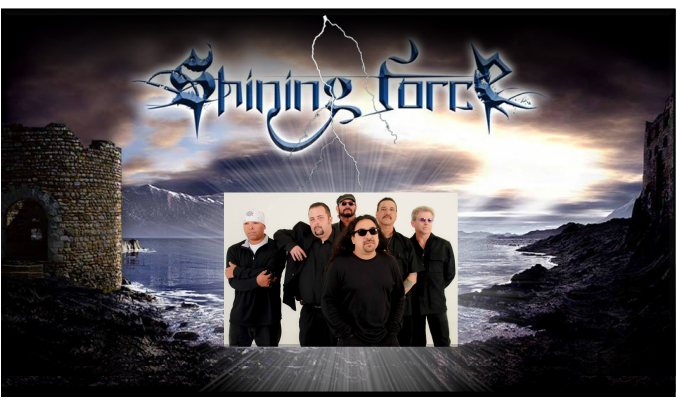 Hailing from Pasadena, TX, 'Shining Force' formed back in 1995 by guitarist Billy Vaughn. Shining Force is a Power Metal outfit whose arrangements and sound is comparable to such big acts as Iron Maiden. ​ As Billy Vaughn decided to pursue his call to reach out to Metal fans, he was soon faced with the challenge of choosing a band name. Vaughn explains: "I thought of the name after thinking about being a light to people as Jesus has told us to do. So I called my band 'Shining Force' and used the scripture, Matthew 5:16 "let your light so shine before men that they may see your good works and Glorify your father in heaven" so we used this scripture to go by." In 1997 Billy connected with Vocalist Randy Dickey who promptly joined 'Shining Force' giving them an official frontman and a distinctly defined sound. 'Shining Force' got their start by playing at a Bible Study and soon God orchestrated the band and they captured the hearts of several street ministries. Through one of the outreaches they met the Aguilar’s who in return funded their first demo in 1998 titled “More Than Conquerors”. during the next 3 years, the band played at several hundred different venues all over the area reaching many for the kingdom of God. Then in 2001 the band released their debut album titled 'Holy Nation'. This debut release was produced through Dewlen Studios and received good reviews from various sources like webzines, magazines, and several radio stations where the band was heard across 26 countries. Even though 'Holy Nation' received good reviews, the band wasn't happy with the overall production which was mostly due to being under funded. In 2003 the band released their sophomore self-titled album 'Shining Force' on Blood Bought Records. This follow up release finds the band showcasing Power Metal arrangements along with tighter production than that of their 2001 debut. When the band was originally recording this release, Blood Bought Records had in mind to redo and reproduce their debut 'Holy Nation'. However, during the recording process, Billy Vaughn convinced them to change the album's direction by showing them that what the fans really wanted was a new album with new tracks. With B.B. Records in agreement, 'Shining Force' moved in a different direction and consists of 15 tracks which includes a few tunes from 'Holy Nation' along with some additional new tracks. This release was a step up from their debut but the band wasn't completely satisfied with the production. The recordings sounded good in the studio but when 'Shining Force' was sent to production/duplication the overall mix was muffled. However, with the release of the band's sophomore album, the band began to garner a larger fan base as Metalers began to notice just what this band from the lone star state could actually do. Every now and again, an album comes across my desk for review that stands out from the rest as it oozes and drips pure Molten Metal. This is the case with Shining Force's 2003 self-titled album which should come with the warning - too hot to handle without metal tongs. This was a solid release for the band capturing that 80's sound along with good production and musicianship. Frontman Randy Dickey is no second rate vocalist as he brings to the table a strong powerful delivery that often brings to mind such vocalists as Bruce Dickinson(Iron Maiden), Jimmy P. Brown(Deliverance), and Scott Springer(Halo). What I like about Randy Dickey's delivery is that he is in no way constrained and lets it fly while staying in character throughout the entire project. Randy also does a good job of mixing things up with his varied vocal styles which keeps repeat listens interesting and gives the listener more to look forward to from track to track. The guitar assault is brought to us from a duo guitar approach from Lead Guitarist-Richard Navarro & Rhythm Guitarist-Billy Vaughn(Founding Member). the guitars are well handled and move from Power Metal riffs to Thrash like shredn to acoustic and even to some Doom like riffs. Navarro & Vaughn's axe work is nothing short of aggressive and helps to draw one into this stellar project. I must say that the guitars are well placed in the mix so that they are not dominating the scene while still being heard clearly. Throughout this release, Bassist Jose Chavez lays down some monster Bass lines for 'Shining Force' giving each track a fuller heavier sound. Ralph Mendez drops the hammer on the skins with some intricate drumming styles. Often, the drums have that raw feel to them which couples nicely with some of the Thrash riffs adding a subtle touch to the album. Also, it's worth noting that Mendez is no stranger to the double bass petal as we often find him adding gas to the mix. Ralph Mendez also handles keys for the band and his work is well represented in the ballad "All To You" which features the piano. Many bands claim to be christian outfits and when you began to investigate their lyrics what you often find is an empty message. However, 'Shining Force' makes no bones about who the band is serving with lyrics that lift up our Messiah-Jesus Christ as Lord and Savior. In the following, the band openly communicates their approach to lyrics: "Make no mistake Shining Force is honored to call Jesus Lord. We do not judge rather minster through love and provide a positive Metal product with the message of life and salvation through the King Jesus Christ. Our lyrics are plain and we do not hide our Faith in order to please the media or masses. Our Vision is simple; see souls won to the Kingdom of God, set the captives free, minister to the sick, imprisoned, children, hungry, widow, orphans and single parent homes." He paid the price for your wages of sin. In 2007 'Shining Force' began working on their third release titled 'By The Blood'. The recording process is complete however, the album is still sitting in the studio mostly due to job related constraints combined with the fact that Billy Vaughn was diagnosed with liver disease. Due to costly medical bills there wasn't enough dinero left to finish the process of mixing and distribution. Vaughn received a liver transplant and went through a long recovery but is now well and finishing the mixing process for 'By The Blood' and hopes for a 2017 release. This album has been in the making for 10 years so the band is excited about its upcoming release. Moreover, 'Shining Force' is actively in the process of recording their fourth album that will be released after the release of 'By The Blood'. This fourth album will be simply titled 'Seven.' It is promised to be even heavier than 'By The Blood' so look forward to more speed and more head banging music to worship God with. Andy Guerrero-The jazz Bass on "A La Chamba"